If you’ve got love on your mind from sunrise to sunset there is only one place you need to be, Love Bingo. It’s the kind of love that will last through all eternity and you surely can depend on. Love Bingo captivates the bingo player’s spirit into submission. The bingo bug may bite you if you don’t watch out; if it does, you may find yourself singing the praises of BINGO! One glance at the homepage of Love Bingo and players soon realize it’s not a bug at all, but Cupid up to his tricks again. A precautionary warning is in order, because when you least expect it Cupid will draw back his bow and aim straight to your heart. If it’s any consolation you won’t see stars when struck, rather red mesmerizing floating hearts will flutter about. Love Bingo is so enchanting that in reality you’re bound to fall in love with this site either way. It’s a vibrant online bingo site that is filled with promises of a time well spent. There is a strong community base of players that could ignite a romance or two while consorting with your bingo roomies. It’s certain to tug at your heart strings as the site delivers an optimal internet package of extraordinary games. St Minver is a software committed in the development of unparalleled gaming. Award winning products are an ideal platform that powers online bingo operators with cutting edge technology. Love Bingo is licensed and regulated In Gibraltar. One glance at the games offered and a passionate desire to play becomes eminent. 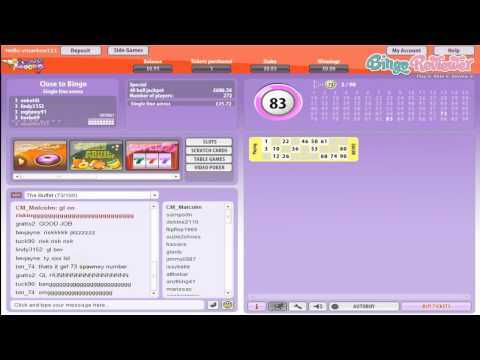 There are two bingo choices: 90 ball and 75 ball bingo with 7 bingo rooms in total. It appeals to every type of bingo player including a more conservative player with tickets starting at .01 each. A buffet of Progressive Jackpots is available including Slots. Speaking of slots, there is only word that comes to mind “amazing”. There are a total of 11 jackpot slots with over £175K on Monte Carlo Billions and Rob in Hood. The list continues with a large selection to choose from with coin values starting at 1p. It’s not poison ivy causing that itch; it’s Scratch Cards that will cure the craving to scratch with an assortment of cleverly themed cards to choose from. Every gambler has a hankering for some casino action. If you have a weakness for Blackjack, Roulette and Poker the Casino Games will lead you straight to temptation. Love Bingo wasn’t satisfied to stop there so they have an array of Arcade Games offering some of the most popular games in the online industry. Don’t fall out of love too quickly just because the no deposit bonus is, well how shall we say a touch insignificant. It’s better than a sharp stick in the eye as my grandfather use to say! Make sure to deposit within an hour of registering and catch a super first Deposit Bonus. If you snooze you’ll lose on this fantastic offer. The Cash Match Days offers extra cash on your deposits on specified days. The Daily Guaranteed Pots are available all month long with £65,000 to be given away. Monthly specials with gifts, cash bargains galore are offered on specified games. The VIP Programme is so elite, it’s by invitation only. There are four prestigious levels to this club offering valuable benefits you won’t want to miss. The more you play the quicker the rewards will come your way with this exclusive VIP club. The VIP club is one of the best around for pampering players. The slot selection is phenomenal with massive Progressive Jackpots. We rate Love Bingo with 4.25 Pink Hearts. Love Bingo? Of course I do and so do you! And you will love it at Love Bingo. What a catchy name. A new site has a lot that needs to be offered if it is going to be successful and it seems they haven't let any detail slip at Love Bingo. The St. Minver software platform that is used at Love Bingo has some of the best games available in the online bingo market. You will enjoy playing bingo games here of the 75 and 90 ball variety, and you will be amazed at all that they have to offer in the way of slots. Keep in mind there are many progressive jackpots itching to be won, and wouldn't you love to be the one to cash in on one of those! Let's hope you get a swift invite to join their VIP program and if you are smart in love, you will be smart and make your first deposit when you join and be eligible for the great bonus that will bring to you. Get hit by cupid's arrow here and maybe even fall in love all over again as your hearts fly figuratively all around you. You never know, one of your roomies in a chat may turn out to be the love of your life! Are you curious to find out? Participate in the chat games with the great chat hosts they have here and even if you aren't luck in love you will find your reward in bonus money for more play time at Love Bingo. This is a nice little Bingo site that explores the Cupid theme, that I don't really see compatible with Bingo games, but hey, I've seen far weirder sites. I like the graphics and it looks very clean, comparing to some other sites, easy to navigate and generally feels smooth. It is intuitively organized, and it took me a click to find all the information i was looking for. They use St Minver for software provider, and although I haven't seen many similar sites, I am really impressed so far. There are four Bingo rooms: Bingo Buffer, Bingo Cafe, Bingo Party Live and Bingo Ballroom, with 75, 90 as standard, and even 80 ball variant as well. It's a pity there is no 30 ball Bingo supported, but it is something to wish for. If you like to chit chat, you should know that there are 17 different chat games to enjoy. The £1 No Deposit Bonus doesn't sound that thrilling, but you do get a shor or two to try how it all works, and a 200% first deposit bonus up to £125. I was definitely happy with my first-time gaming experience at love bingo. They have so many things going for them and so many things to take advantage of. One of the first things that I was impressed with upon my first glance at their games was their selection of bingo. They have 75, 80 and 90 ball bingo variations available. It’s so nice to see just a little extra more than the basic two varieties that are offered everywhere you go. I like having options and I felt they did a good job of offering that to me here. There is also a room dedicated to free bingo, which you simply can’t go wrong with. Plus, they have so many other games available in addition to bingo. I love my slots as well and they have a nice selection to choose from, along with some incredible jackpots! Don’t miss out on their awesome promos either!